Kid's Room Decals ~ Retro Owls! Home » Kid’s Room Decals ~ Retro Owls! Kid’s Room Decals ~ Retro Owls! 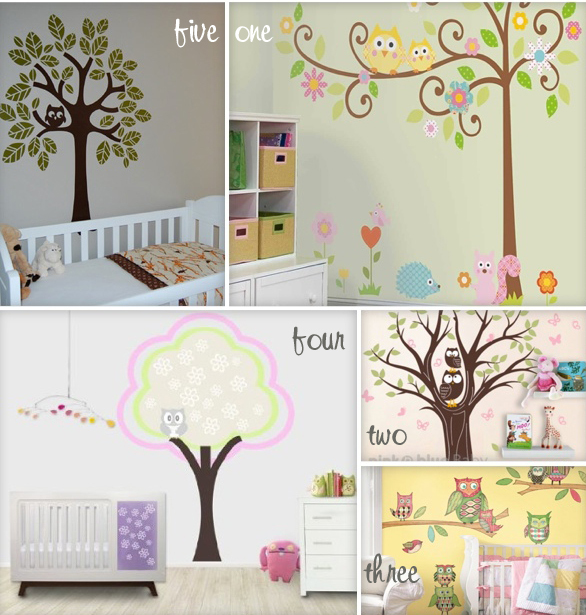 Adding a tree decal is one of the easiest ways to fill a wall in a nursery while adding some whimsy to the decor. Over the last couple years retro owls have become very popular and are popping up on sleepers, bedding and wall art. When you add these two trends together it results in a sweet scene perfect for a playroom, nursery or toddler’s room. We have rounded up our favorite retro owl decals. We love that they’re all bold, modern and easy to install! Owls and Branches($30) – One package includes 8 diecut owls, 2 birds, 6 branches, 80 leaves, and 22 assorted flowers. jäll & tofta ~ A cradle, rocker and bed in one!